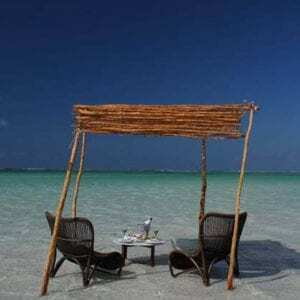 Situated on a remote beach 30 km outside Nacala at the entrance of the bay, Ossimba Beach Lodge offers a superb beach, water sports and scuba diving. It is surrounded by 50 hectares of natural forest teeming with bird life. This is an Eco Lodge run purely on solar energy. Ossimba Beach Lodge is a newly built luxury lodge situated in Northern Mozambique. Coral Lodge 15.41 is a modern, African-style beach resort, which offers you the latest in luxury and comfort while maintaining that authentic feel of Mozambican pureness. The resort’s design, by Dutch designer Edward van Vliet, incorporates the colors of its environment using wood and brightly-colored textures. These natural materials make the resort blend in perfectly with the surroundings.